There are no major economic reports in the UK but Brexit still takes the lead for its impact on GBPUSD. The US will release Dallas Fed Manufacturing Index. The support rests at 1.28220 with resistance at 1.28740 which the weekly pivot point at 1.28380 is located in between the lines. The EMA of 10 is moving horizontally in the ascendant channel and it is below the EMA of 200 and the EMA of 100. The RSI is rising above 50 level, the Stochastic is moving in high ranges and the MACD line is below the signal line in the negative territory. The ADX is not showing any clear signals. 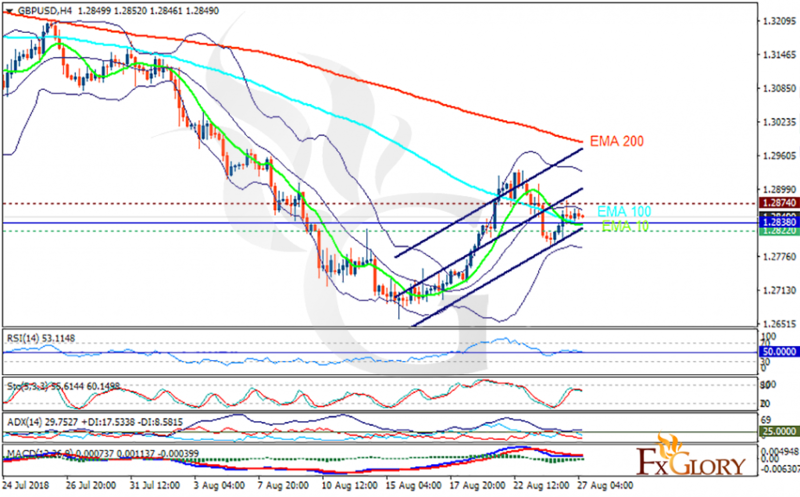 The market will remain quiet today and GBPUSD may be fluctuating within the lower and upper Bollinger bands.